One name made this years Capitol Hill Block Party more epic than ever: Sonic Youth. The New York indie rock veterans are arguably the largest band to grace the festival's bill, ever, and proved to be worth way over the $20 ticket prices. The booze-filled fest was hosted under a rare scorching Seattle sun, making it a tiring but celebratory event. Regardless of the boiling heat, flannel, beard, and skinny jeans ensued, as well as local celebrity sightings of the Fleet Fox and Long Winter kind. And suprisingly, the street-cart food was amazing: phad thai and red curry, fresh tacos with limes, and famous Seattle hot dogs, cream cheese and all. But the thing I enjoyed most was the crowds, or the lack thereof. Last year, the crowds were unbearable, presumably sparked by the sudden frat boy obsession with Girl Talk, the teeny bopper Juno lovin' Kimya Dawson fans, and the blogger favorite, 15-minute of famers Vampire Weekend. This year was a different story. There was a perfect amalgamation of indie rock legends (Sonic Youth, Built to Spill), up-and-comers (The Pains of Being Pure at Heart, Japandroids), buzzworthy locals (the Gossip, the Moondoggies), and the outright insane (Truckasaurus, Wild Orchid Children). So, among the 100+ acts to grace three-stages over two days, who stood out? 1) The Wild Orchid Children: This band is the funnest band I've seen in ages. The Kid Rock-esque singer, sporting long hair, a white trash persona, and a Run DMC tanktop, was just the tip of the psychadelic iceberg. The Seattle band summoned the ghosts of At the Drive-In, the sporacticness of the Mars Volta, and the angsty energy of Rage Against the Machine all the while taking you on an acid trip you don't want to come down from. With more drums and tamborines than you could shake a stick at, the band put beauty in the details, along with synth medellings and enough guitar effects to make Tom Morrello jealous. In some ways I want this band to blow up. In other ways I want to keep them one of Seattle's best kept secrets, watching them play at hole-in-the-wall DIY venues. 2) The Thermals: The Thermals have never been a stand-out band...and that's what's always made them standout. Their simplicity in song craftsmanship is admirable, and their pop sensibility in undeniable. Their covers of Nirvana's "Sappy" and Green Day's "Basket Case" were charming, yet somehow unironic, fitting perfectly within a set of the band's best songs that spanned their entire career, including the No Culture Icons EP as well as their newest efforts Now We Can See . 3) Maldive: I literally stumbled into this set. I had never heard of the band, nor intended on seeing them, but I was at the right place at the right time, I guess. Plus there was a huge fan near the bar and I was drenched in sweat. The band filled the stage, with members of acoustic, electric, and slide guitars, banjo, drums, and anything else alt-country you can think of. They were all sorts of Whiskeytown, with a twist: they were a jam band too; ballads with extended endings. Cliche' country themes of booze, girls, and heartbreak never sounded so good. 4) Built to Spill: This one's an obvious choice. Built to Spill is known for their live shows. Doug Martsch and the rest of the Crazy Horse obsessed rockers really know how to jam, with a setlist spanning their career, from "Kicked It In the Sun" to "Going Against Your Mind", extending some songs way past their album running times. With a hint of evening drizzle in the air, just standing there amongst hundreds of others was a visceral experience. Or maybe that was just from the second-hand smoke. A lot's changed in five years, more specificially the direction and scope of Seattle's own Death Cab For Cutie. It's been roughly half a decade since I last experienced the band's live show, supporting the release of Transatlanticism. In that amount of time, the venues have gotten larger, their popularity skyrocketed, their reach gone worldwide. When Ben Gibbard and crew stepped on stage at Marymoor Park, I felt a little bit disappointed, not in the realization they were now, five years later, a different band, but in the realization I'd passed up so many opportunities to see them perform since their rise to stardom. Sure, the audience has changed, stage theatrics have been added, and Top 40 singles have stumble onto the setlist, but the band still puts on one heck of a show. Opening with "Marching Bands of Manhattan", the band resonated a much fuller sound than their latter albums suggest, due much in part to the genius musings of multi-instrumentalist Chris Walla. 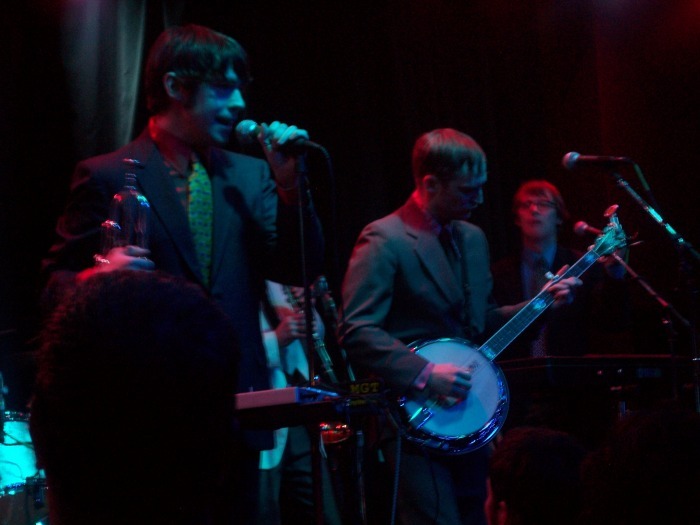 I also couldn't help but notice the vocal improvements of Mr. Gibbard; the band has always been notable live performers, but Gibbard's vocals have sometimes wavered from studio-worthy (maybe he was a tad out of shape). Not the case now. The setlist itself was somewhat of a mixed bag, though obviously formulated for an upbeat, energy-filled show, somewhat contrasting the slow, jam-sessions of Showbox yester-year. 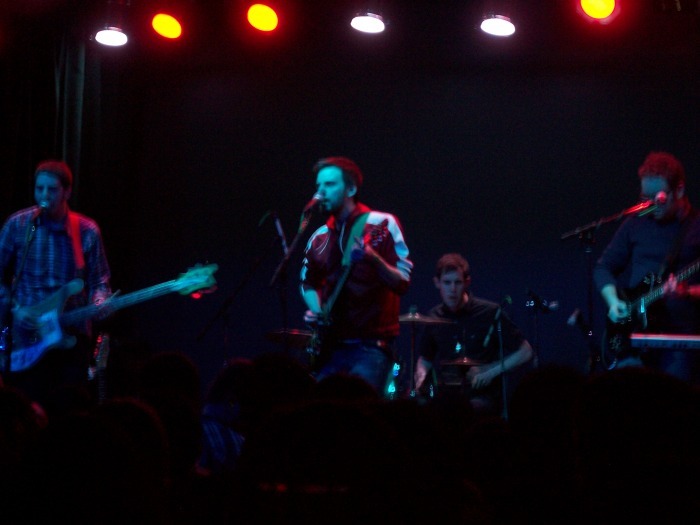 Songs spanned the band's entire career, from Something About Airplanes "Pictures in an Exhibition" to the Open Door EP's "Little Bribes". Nothing seemed too out of place, save the acoustic ballad "I Will Follow You Into the Dark", which momentarily changed the energy of the night: not too different from a "Time Of Your Life" moment at any Green Day show a decade earlier. Suprisingly, Narrow Stairs-era tracks were minimal, considering it's fairly recent release; "I Will Posses Your Heart" made for a great concert staple; "No Sunlight" still played as a token radio-hit any Seattle band should be embarassed about. As I stood next to my brother who was having his first live Death Cab experience, I couldn't help but reminisce of the old days, days where "Company Calls" actually bled into "Epilogue", where bass-solo's (see: "Crooked Teeth") were unthinkable, and where encores ended past midnight, not the 10PM cut-off the Marymoor show seemed to have. Bitterness aside, I felt I did feel a little guilt slip in and the band ended their set with "Transatlanticism". Like Morrissey once said "We hate it when our friends become successful", I shut out the idea of paying for a Death Cab concert the moment it stopped being possible to buy tickets at the door; playing the Key Arena just out-right seemed ridiculous. But as I stood amongst a crowd of Washingtonians, the gorgeous setting sun washing over the stage, cool summer air blowing, I realized one thing: no matter how big or small, there's something about the band that will always been a part of the Northwest, just like the rain, the rush-hour traffic, the garlic fries at Mariners games, or the promise of coffee at every turn. Pitchfork-acclaimed, Seattle-centric Fleet Fox frontman Robin Pecknold rattled the ears of a packed house last Friday with his golden pipes. Without being shrouded in band member's harmonies and musical stylings, Pecknold was left to fend for himself (save a few songs where J. Tillman jumped on drums), proving he could just as easily leave the blog-friend Washington band and make it on his own. He played a number of covers, including Neutral Milk Hotel's 'Two-Headed Boy' and Fleetwood Mac's 'Dreams', where his sister Aja jumped onstage, (vintage Mom jeans and all), and accompanied him on vocals. Although nervous to be solo, Pecknold's performance was confident, soulful, thunderous, and yet somehow intimate. He made sure to treat the crowd to a few Fleet Fox tracks as well, including an oldie, 'Icicle Tusk' and 'He Doesn't Know Why'. If you aren't familiar with his face, Robin can easily blend into the sea of plaid, beards, and jeans that make up the Seattle scene. His musical talents on the otherhand, are outstanding both vocally, and in music technicality; he's a master of words, of melody, and of guitar. Last night I had the pleasure of attending the Three Imaginary Girls-hosted "Top of the Croc" concert at, where else, the newly renovated Crocodile Cafe. The 'Girls' treated us to the likes of BOAT, Tullycraft, "Awesome" and iji. Having never attended a Croc show in any of its incarnations, it was an experience in-and-of itself just to walk in the doors. At 23-years-old, I felt like a youngin'. Self-consciously I felt like an inexperienced Seattle-ite and concert-goer. In the back of my head I knew I had never seen the rise and demise of the grunge scene first hand, something I was positive was engrained in most these attendees; I couldn't quite help but feel like a phoney amongst these weathered vets. Thanks to some poor parking decisions, I arrived too late to catch the "up-and-coming" opener, iji. So, BOAT was just getting on as I stepped in and I was pleasantly suprised at what I heard: a fresh band with a definitely distinctive "Seattle sound". Their manic clean guitar and poppy structuring fits perfect in between the Long Winters and the Red Stars Theory. Though lyrically they seemed to lack depth, their ear-to-the-Seattle-sound-ground mentalities made them all the worthwhile. BOAT is charming, but still has some way to go in defining themselves beyond the hundreds of other 20-somethings raised on early Modest Mouse albums. That quirky aura they have to them is enough for now, but I hope to see bigger and better things from these guys in the months and years to come. 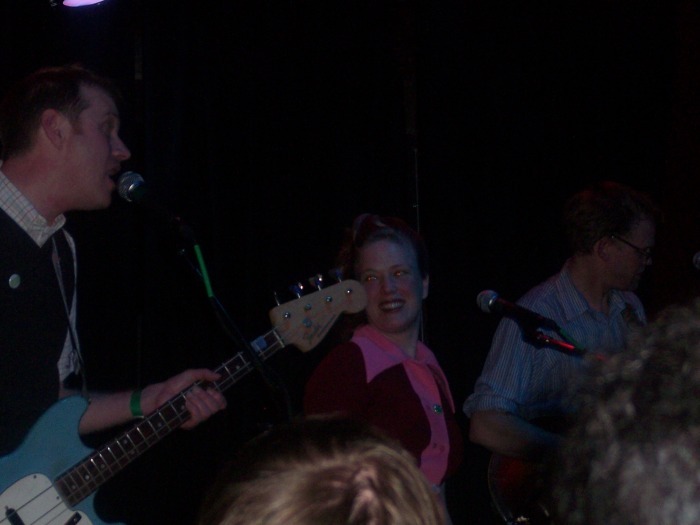 Tullycraft was something cut from a completely different fabric altogether, paralleling Camera Obscura, the Lucksmiths, and Belle & Sebastian with a little doo-wop twist. Overall, the band ran a tighter ship than BOAT (pun intended), feeling a little more at ease, a little more fluid, and a little more rehearsed, though their set began to blend together and lose its sparkle before "this is our last song" was ever announced. "Awesome" on the other hand is from a completely different world of their own. Their multi-instrumental musings and a frontman with David Byrne-esque mannerisms was both intriguing and abrasive. They teetered on the fine line between 'creative' and 'too much', but wether they were good or not almost seemed irrelevant to the masses as they charmed the crowd with their kooky style.